2) 14c French: 1950-1951 - Orange, Yellow Fork ?? ?, Tan driver - 108 mm - Text baseplate ??? Pictures??? 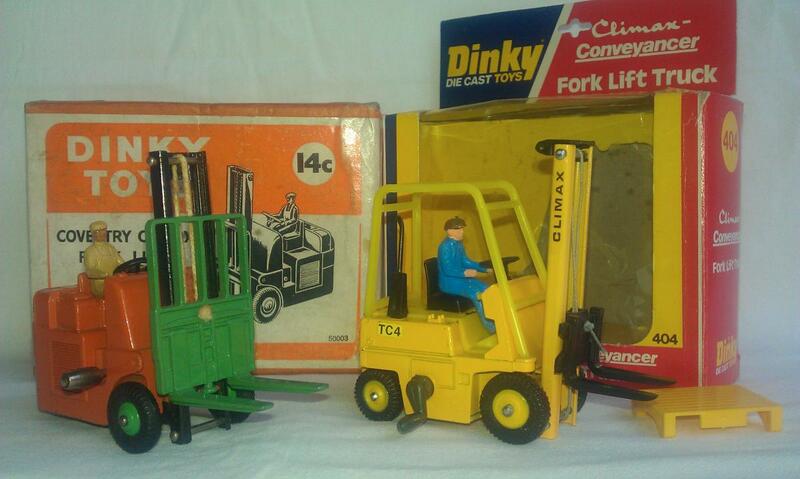 5) 404 UK: 1967-1980 - Red and Yellow, later Orange and Yellow - 97 mm - CG4 decals, Pallet, Instruction sheet. Steerable. 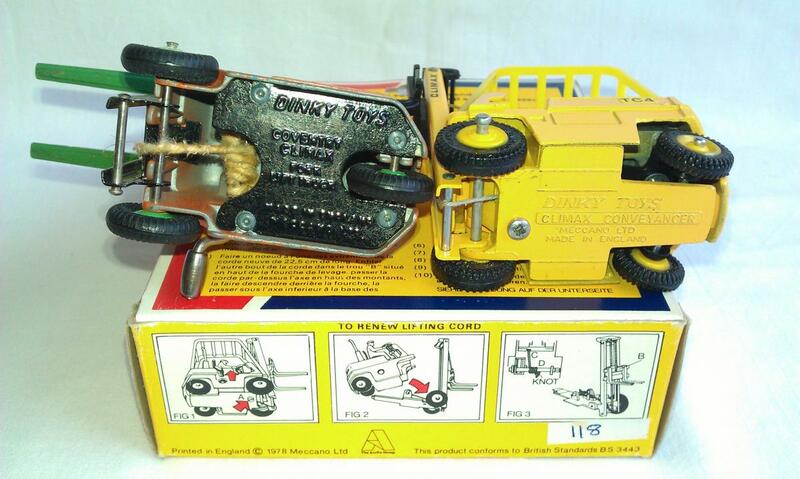 6) 404 UK: 1978-1980 - Yellow - 97 mm - TC4 decals, Pallet, Instruction on the back- and underside of the box. Steerable. I hope at reactions in this forum with additions of information and variations, even for model 404. OK ... of course ... I know. .. the later models, such as 404 have plastic parts, but to speak with the daughter of Frank Hornby: "Aren 't they Dinky!". It deserve a place in this forum too. I'm from 1946, but hope that also younger members the stunning "modern" models from the period 1960-1980 will show and discuss in this forum. I have for instance some questions about changing the name of model 404. 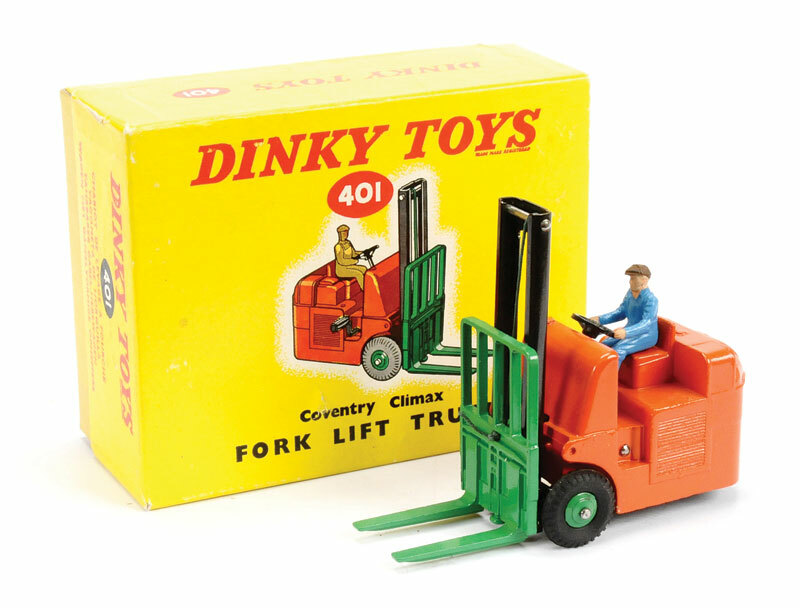 Why were the name of model 404 changed in 1967 from Coventry Climax to Conveyancer Fork Lift and why were model 404 after that in 1978 changed in Climax Conveyancer? 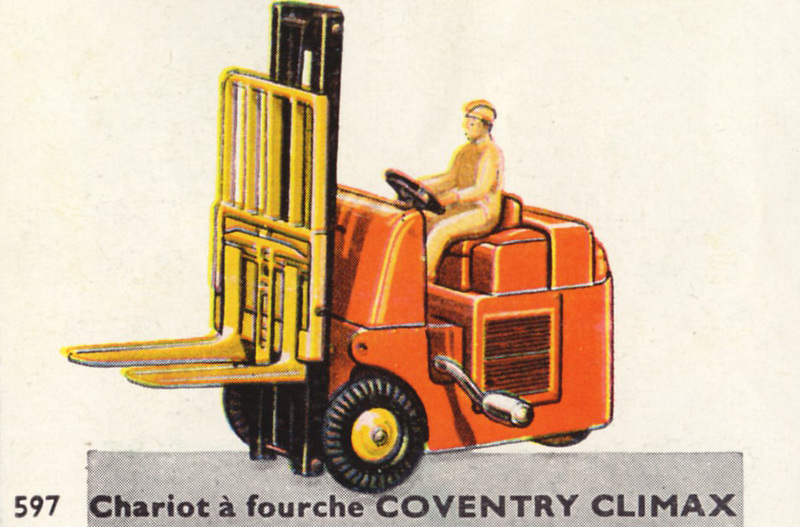 Did the Coventry company no more exist in 1967? 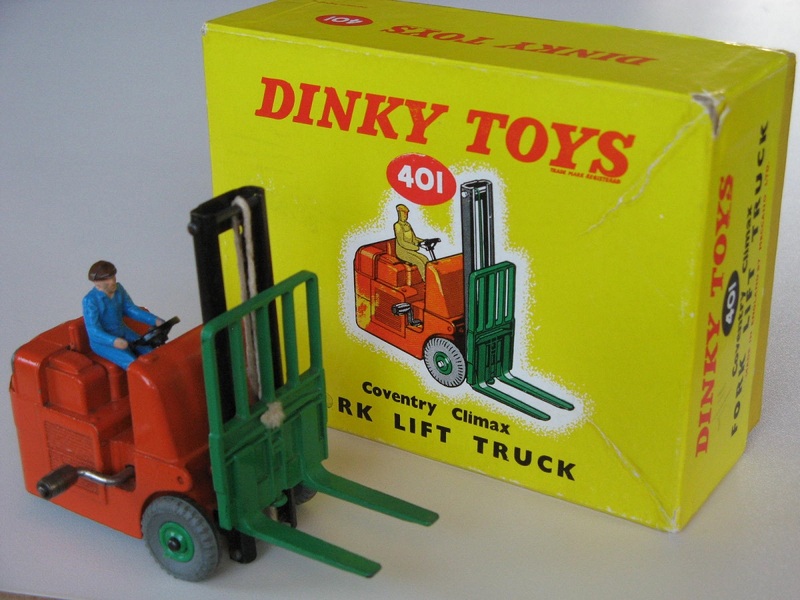 Is model 404 a reproduction of a real one from an other company than Coventry? I am a Dutchman (not the flying Dutchman) and don't know enough about the British Companies, but I am interested to know that. I hope that UK members can solve these questions. I have mentioned before that the both the French assembled model and its box and official French illustrations show some remarkable inconsistencies as the name and the representations of the model are concerned. Firstly, the French pictures are all mirrored, showing the handle and the box next to the driver's seat on the left side of the model. This goes both for the French box for the early import version and the one for the later French assembled issue. But for the catalogue pictures as well. 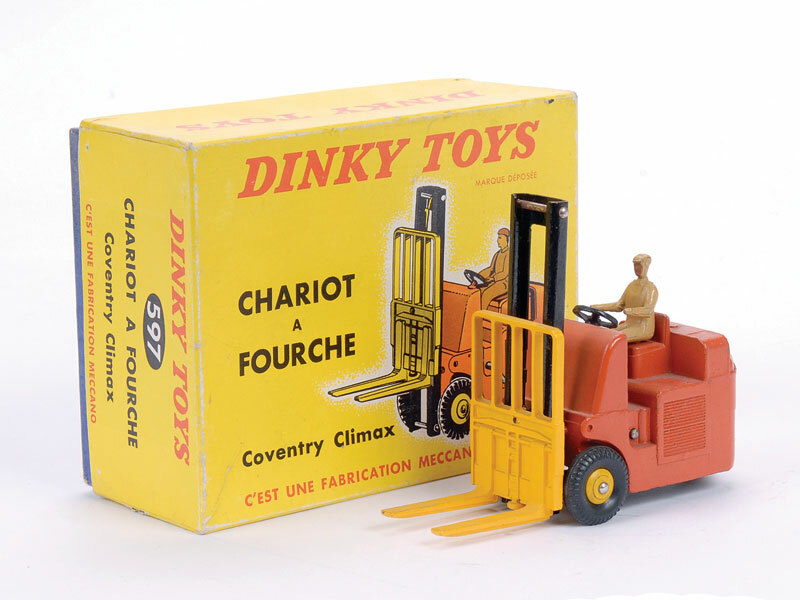 Secondly, the base of the French assembled Fork Lift Truck reads clearly CHARIOT A FOURCHES (plural), whereas all the box titles and the catalogue texts show CHARIOT A FOURCHE (single). Thank you Jan for your comment and the pictures. An interesting addition from you in terms of the difference in the modelname on the box and the base plate. Thank you for the very sharp picture of the base of 597. Very clear. Well noted that the image has been mirrored in the catalog. Fascinating to discover these things. That is the fun of the hobby. I still have a question about my photo of Box 8: 401 UK: Does this model actually exist with a blue driver? Patrick Trench and Ramsay describing this model only with a Tan driver. thank you for an excellent summary of an often-overlooked model. I have four examples in my collection, so, Jan, using your box number system, I hope this brief summary will answer your question about the box type 8 model. My first model is is an early production in box type 1, orange lid, orange label and lettering, which has a date stamp on the base 'ASo29' - but I am not sure what this represents - I originally thought February 1949, but the model was not released until November 1949, so that can't be correct? Another mystery! My second model is in your box type 5, orange lid, green label, green lettering, and thoughtfully, someone has written 'Xmas 1949' in tiny letters on the top edge of the lid label. The box base has the date stamp 'BF109' so October 1949, just in time for Christmas! My third model is a later issue in a type 9 yellow-lidded box with blue base, and inside the lid is the date stamp '12 EO 61' so presumably December 1961. 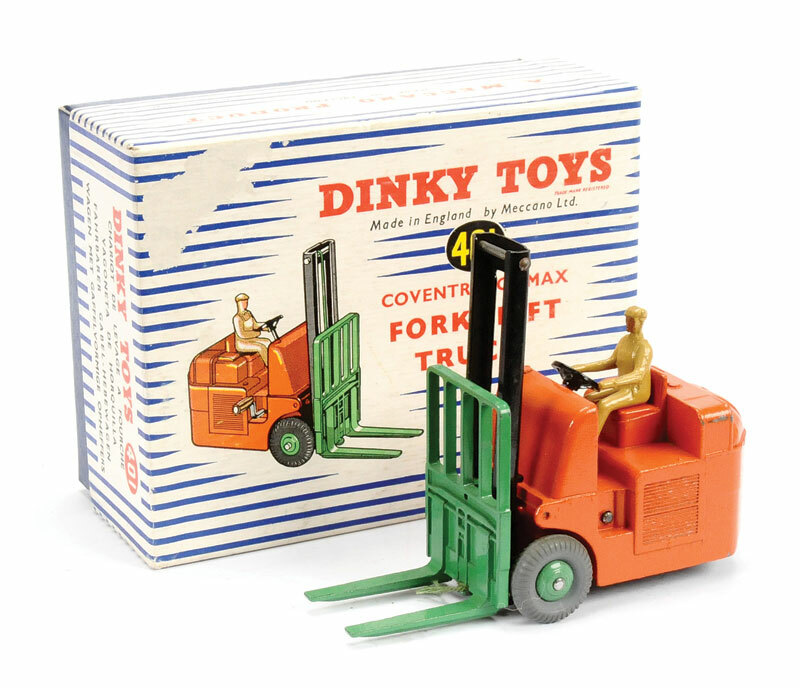 This model has a tan-painted cast driver and green-painted cast wheel hubs with later grey block-tread Supertoy tyres. Now, to come back to your question: my fourth model is a very late production, and is in a type 8 yellow-lidded box with yellow base. 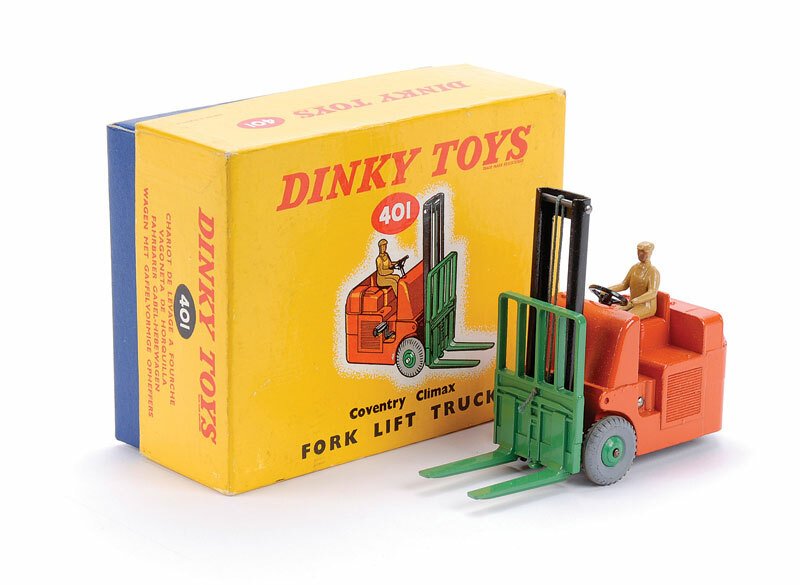 Unfortunately, there is no date stamp on this box, but the model has not only a blue plastic driver, but also green plastic wheel hubs, so is a very late production model - I would think some time around 1963. Hopefully this will answer your question - I think that the blue plastic driver replaced the tan cast one around 1960, and the green plastic hubs were fitted from around 1962. In any case, I think your box type 9 was the earlier one, and the one you listed as type 8 with the yellow base was later (what a pity the date-stamping of the box lids seems to have stopped around 1962). Thank you Adrian for your very valuable addition and your answer to my question about the blue driver with a photo of the subject. 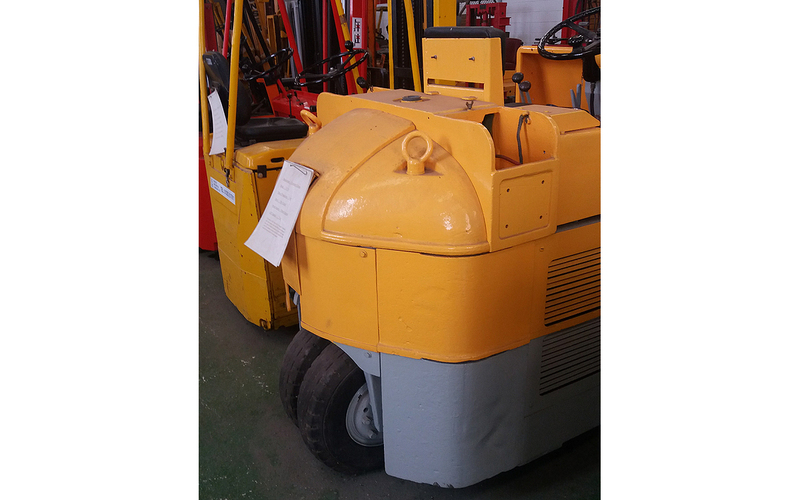 I still found two examples 401 at Vectis with a blue driver, both with model 8 box with also a yellow base as yours. Vectis also talks about a later version. So it is clear that the combination 401 with blue driver with a box 8 with yellow base actually exists. Adrian thank you very much. By the way, as no. 4 is concerned, I have seen that picture before, but box (early 1950s) and model (concave hubs, ca. 1960) do not match, they do not belong to each other. Kind regards Jan W.
Thanks, Jan W. I had already doubts about this combination. That's why my questioning in the description of model 2 of my model list: 14c French: 1950-1951 - Orange, Yellow Fork ?? ?, Tan driver - 108 mm - Text baseplate ??? Pictures???. I have the photo from Ebay with the intention to show the box. I asked the salesman about it, but he evades an answer, so it is not right. Jean-Michel Roulet describes the color of the fork of model 14c somewhat cryptic. He writes: (I have the Dutch translation and I translate with Google in English) - "14C:. 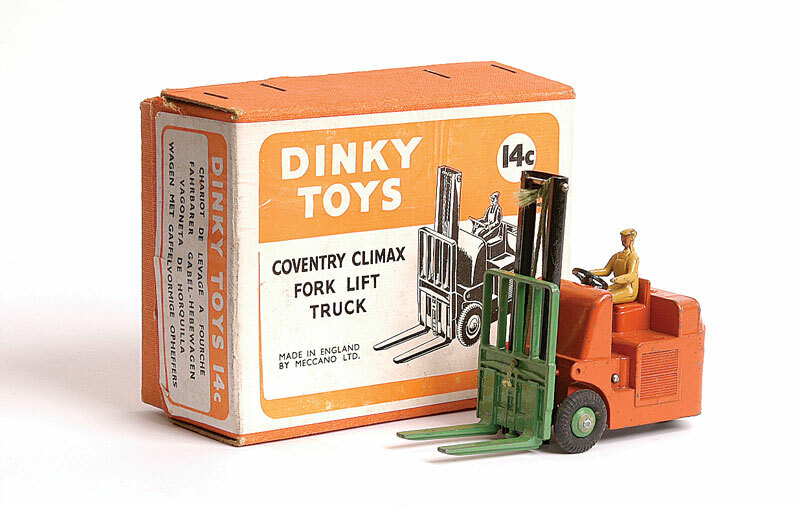 Coventry Fork Lift Truck. 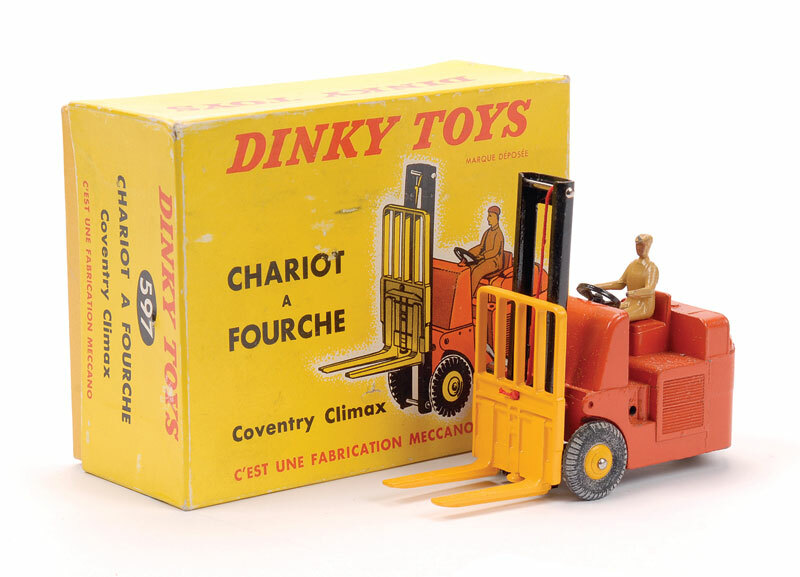 It is an English small Fork Lift Truck sold in a French box of red cardboard with yellow inside, in 1950. But if this model appears again with a cast text: "Assemblé en France" from 1959 to 1961, with the fork yellow painted sheet, and catalog number 597, here is an English model sold in a French box, hence its presence in this list, and not in those of the imported vehicles as is the case with the 27 AC farming tractor, for example. " I think. Roulette is here describing the French box 6 from my list and not the French box 4 with the orange label. But the describing of the model is not clear to me. 1) In what years was the French 14c box 4 with orange label issued (Perhaps a date stamp in the box??) and with which model 14c? French or UK? What color fork and text of the base plate? 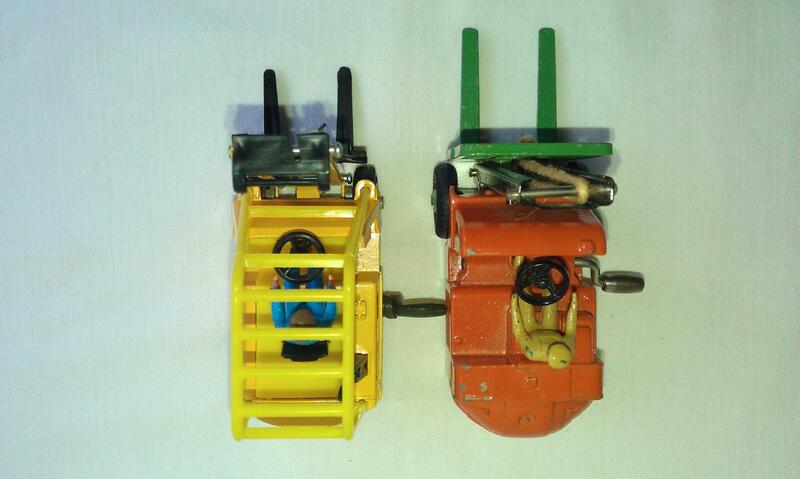 2) Which color model and baseplate belongs to the French 14c box 6?? 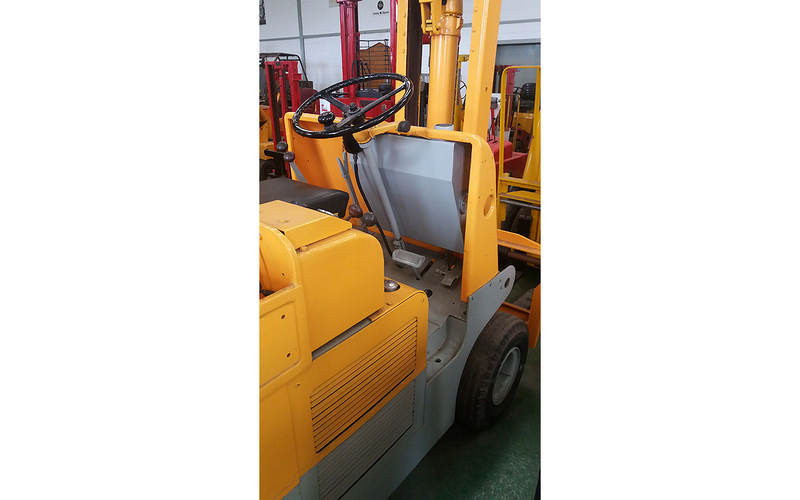 The characteristics of model 597 are clear: yellow fork and French baseplate. I found just now a comprehensive and very detailed article from your hand about 14c Chariot Coventry Climax (1950) in TMT. In that article my latest two questions are answered. Can you copy that beautiful article from TMT in your comment. Hi Jan O., I'm glad you found it. I have written a few hundreds of such 'articles' over there, and later on the Planet Diecast Forum, in the past decade. It is not feasible for me to copy all of them here, that would be a tremendous job. Let's hope that this second version of he DTCA website will live forever, because so many information has gone, or has got hidden and 'frozen', because of the virtual loss or decline of such webforums. Sometimes I get a little bit 'tired' of writing this all again and again. 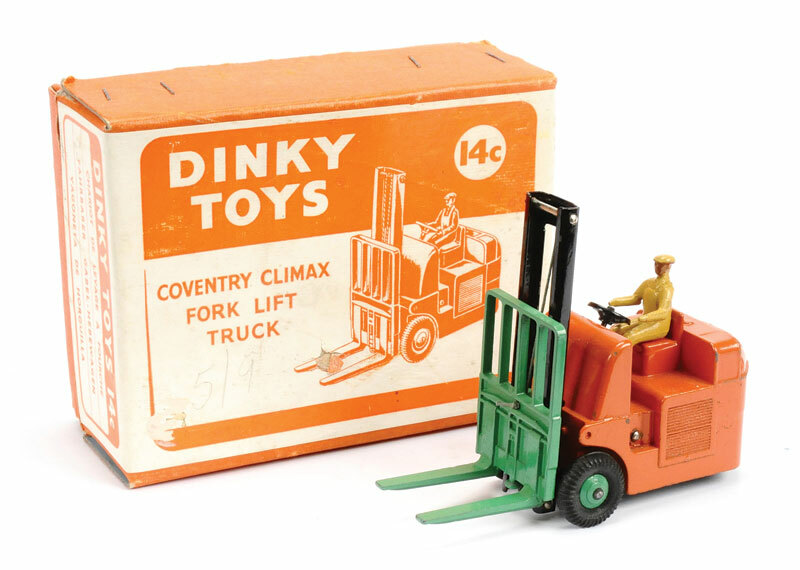 Some of my favourites, however, will be published in The DTCA Journal in a fresh format, in the column 'From my Dinky Toys Collection Catalogue', starting in the next issue. I hope they will be appreciated. I totally agree with the comment made by Dave. I also look forward to your articles. 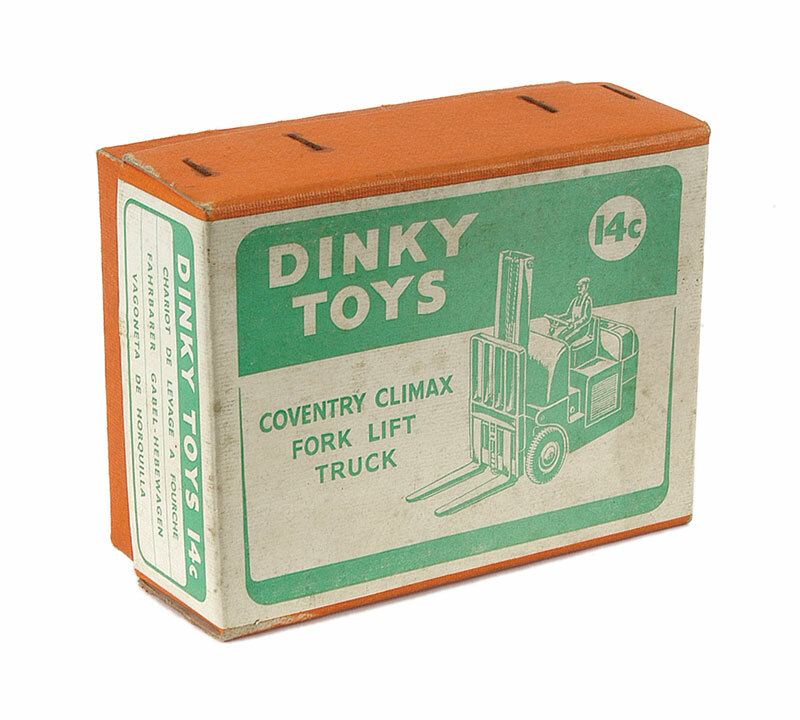 Dinky Toys Fork Lift Truck: Summary and Conclusion. 1) 14c UK: 1949-1954. Orange, Brown or Dark Red. Green Fork. Tan driver - 108 mm - 1954 renumbered to 401. Not steerable. 2) 14c French: 1950-1951. Orange with Green Fork. Tan Driver - 108 mm - UK cast model 14c with UK base plate. Not steerable. 3) 401 UK: 1954-1964. Orange with Green Fork. Tan driver - later blue driver - 108 mm - Renumbering of 14c. Not steerable. 4) 597 French: 1959-1961. Orange with Yellow Fork. 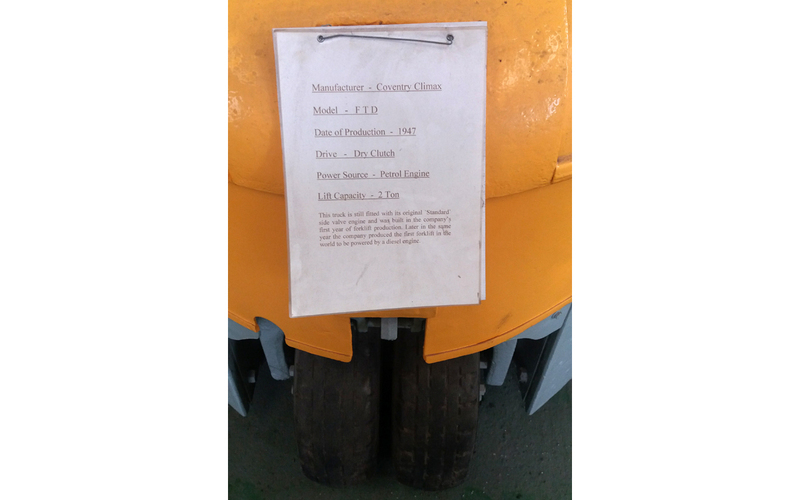 Tan driver - 108mm - UK cast mould - French base plate with text: Paris Meccano Dinky Toys Chariot A Fourches Coventry Climax Assemble En France 597. Not steerable. 5) 404 UK: 1967-1978. Red and Yellow, later Orange and Yellow - 97 mm - CG4 decals. 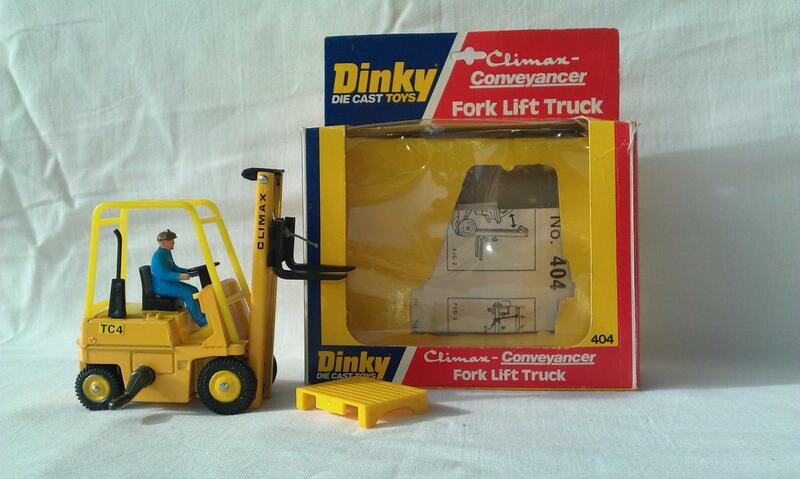 Conveyancer on Fork Lift. Pallet. Instruction sheet. Steerable rear wheels. 6) 404 UK: 1978-1980. Yellow - 97 mm - TC4 decals. 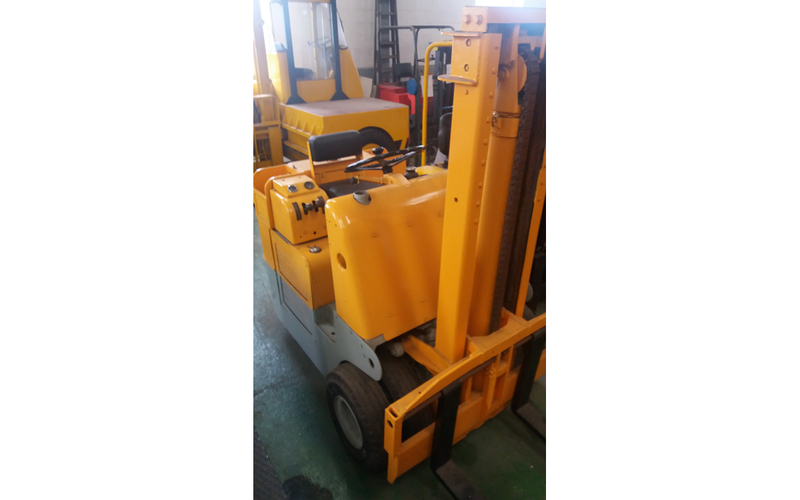 Climax on Fork Lift. Pallet. Instruction on the back- and underside of the box. Steerable rear wheels. 13. UK box: Blue/yellow/red hanged window box/white model lettering. I make the summery complete as far as I know. I can still make changes or additions. I hope still to get response to my questions about the name change of model 404. Hi Jan, thanks for this revision. What is the rationale behind the box sequence 5, 1, 2, 3? I would be eager to know because I never found out. 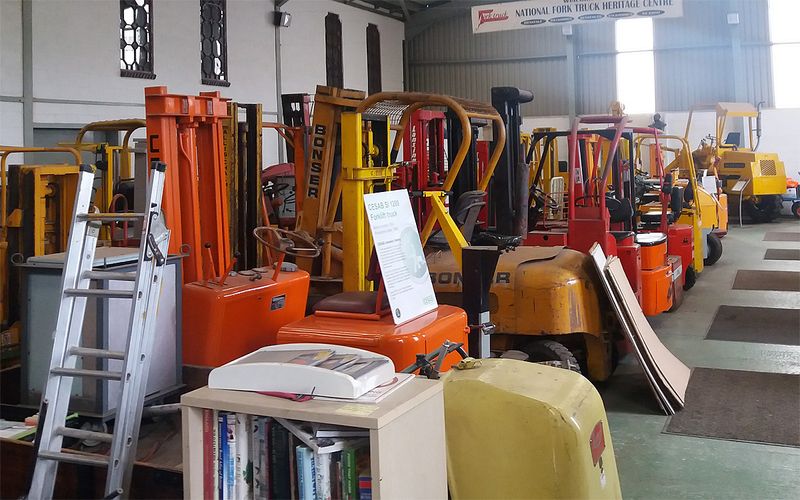 I like these exceptional early 1950s French boxes of the 14c Chariot a fourche(s), 561 Bulldozer, 562 Dumper basculeur automoteur and 571 Grue roulante. But also the earlier red ones for the Chariot a fourche(s) and 27ac Tracteur Massey Harris et remorque ependeur d'engrais. And of course the more common later French assembled ones in the period 1959-1961, also including the 551 Rolls-Royce and 972 Camion-grue roulante (20 tonnes) - 20-Ton Lorry Mounted Crane 'Coles'. A nice, well-illustrated article about these 'unusual' French boxes (and their contents) was published by Brian Salter in Model Collector of June 2006, pages 67-73. 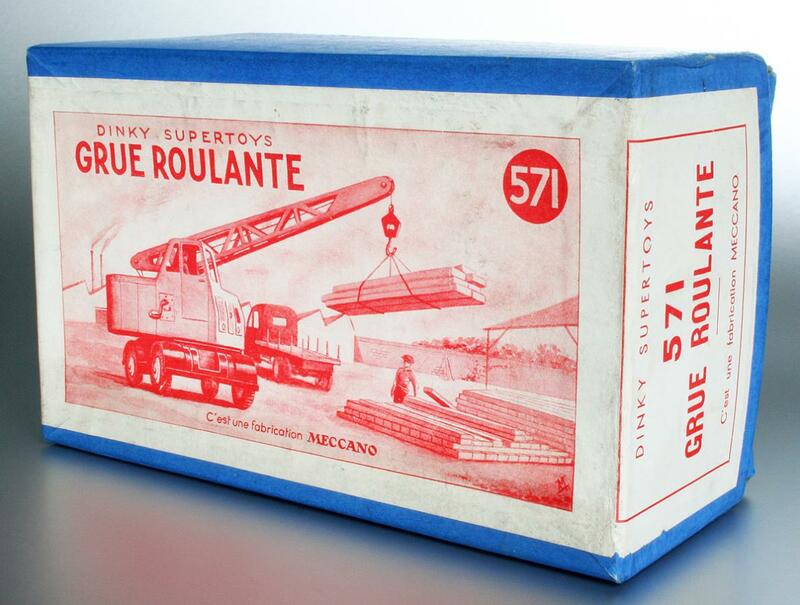 My rather scarce box for the 571 Grue roulante - Coles Mobile Crane pictured below. Hi Jan W. Many thanks for your welcome addition. Considering the valuable comments of Adrian Nash above, about the stamp in his 14c orange box with green label BF109 (october 1949), may this box be the number 1 in the list. The date of the stamp in his orange box with orange label and lettering ASo29 (february 1949 ??) he is not quite sure what date it does mean, but can still be also number one. Can someone explain this date stamp? The 14c was issued november 1949. The other reason that I placed number 5 as first before number 1 in the list is that in TMT two persons also places the UK orange box with the green label before appearance of the orange box with orange label. I found nowhere else information about the UK orange box with green label. I post the list, as the probable order of appearance. I hope at response of more members who have a 14c orange box with green label and lettering or 14c orange box with orange label with a date stamp to gain more certainty about the order of appearance. A very intersting topic.Many thanks.